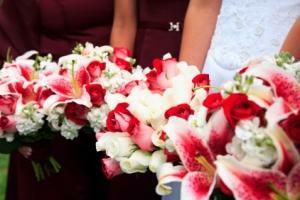 Flowers that go with certain colors such as red bridesmaid dresses aren't restrictive. Factors that can help you decide on color combinations include wedding theme, holidays, color scheme and hues of flower varieties. Before determining the flower styles and colors, first decide on the wedding's theme. Having a specific theme will make it easier to choose what flowers to use. Once the theme is set, review the traditional colors for that theme as your starting point. Holiday themes are a popular choice. If you are getting married during the Christmas season, opt for lots of greenery, and perhaps a mixture of red and white flowers. This enhances the red and green colors of the season. In-season flowers are usually the least expensive; if your budget is tight, choose flowers varieties that are local to your area. Mid-summer weddings around the Fourth of July may include a red, white, and blue theme. Since there is a nearly endless array of flowers available during the summer season, mix and match the varieties to suit your taste. Delphiniums are good choice and known for their vibrant blue hues. For a paler blue, consider using hyacinths or hydrangeas. 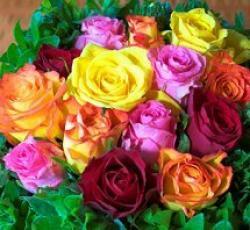 Both create rather large blooms so they are best reserved for single flower or single variety bouquets. A Valentine's Day or romance themed wedding will look fabulous with the traditional red, pink, or white bouquets. The most common colors of flowers available, you should have no trouble matching the red bridesmaid dresses to a complementary flower color. Go with roses for a traditional bouquet and add a bit of baby's breath for a finishing touch. For a less traditional spin, choose a mixture of stargazer lilies and plumeria for a highly fragrant set of blooms. Destination weddings are also especially popular, with beach destinations topping the list. For tropical flowers that coordinate well with red bridesmaid dresses, turn to the trusty bird of paradise. Though it has an orange bloom, mixing it with other tropical shades will tone it down. Cannas and orchids are other flowers that are traditionally used for beach themed weddings. Both are available in a large variety of shades so choosing one to match should not be difficult. Wildflower mixes are another way to showcase many different flowers and hues, while still coordinating well with a red bridesmaid dress. Varying shades of purple, green, and yellow create a casual style, perfect for western or country weddings. Sunflowers are a wonderful flower and are grown in both small and large diameter with colors ranging from the palest yellow to the deepest brown. Start with sunflowers and add daisies and lavender to complete the bouquet. If you still are stumped after reviewing all of the available color options, there is always white. Don't underestimate the simple beauty of a spray of white orchids, calla lilies or roses. If the wedding has a modern theme, a single stem or cluster of callas should do the trick. Leave the stems long and wrap a wide satin ribbon approximately four inches below the blossom so the flowers will be easy to carry and the bloom will not droop. Now that you have determined which flowers that go with red bridesmaid dresses you plan to use, take the time to enjoy the pre-wedding process. Though it may seem chaotic and stressful, you should ultimately look back on the days leading up to your wedding as ones filled with the anticipation of marrying the one you love and want to spend time with for the rest of your life. Book your wedding flower appointment as soon as possible and check that item off your wedding planning checklist.